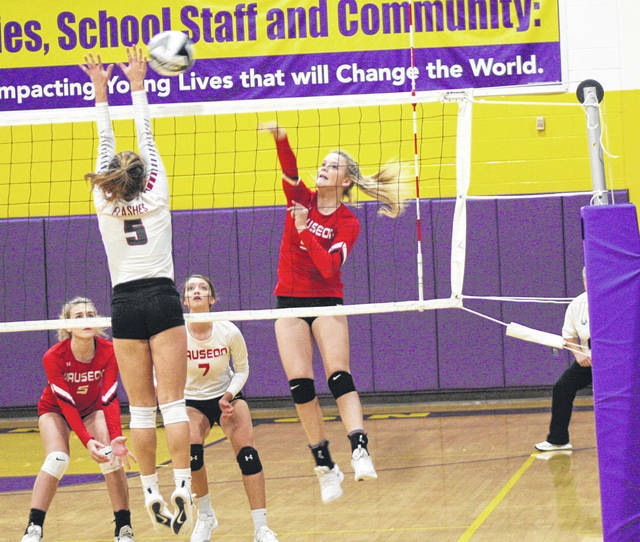 Wauseon’s Sydney Zirkle hits one over the net for a kill Thursday versus Willard in a Division II regional semifinal at Lexington High School. The Indians were defeated by the Crimson Flashes 25-17, 25-14, 25-16 to end their season. Chelsie Raabe of Wauseon, right, tries to fire one over the block of Kassidy Lofland of Willard (5) during Thursday’s regional semifinal. Maddie Trejo sets one for the Indians. 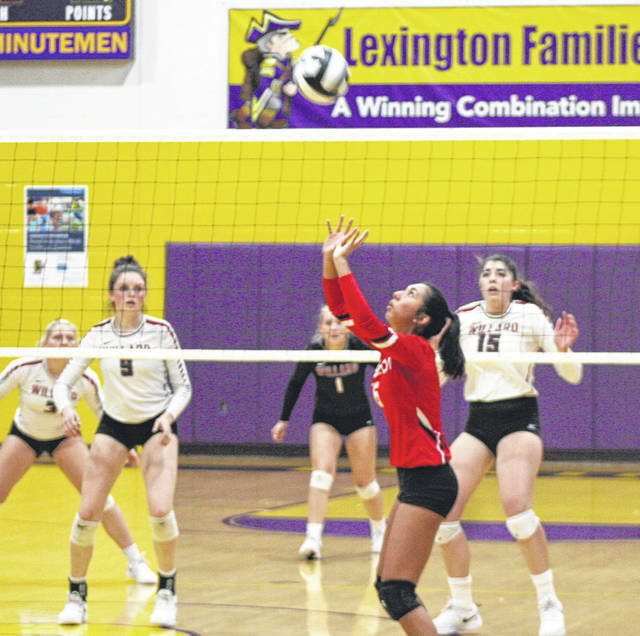 LEXINGTON – Wauseon had its historic season come to a screeching halt Thursday, as Willard’s Lydia Wiers fired off 25 kills in a 25-17, 25-14, 25-16 defeat of the Indians in the Division II regional semifinal at Lexington High School. The Crimson Flashes built a 5-0 lead in game one on a pair of Lydia Wiers’ kills, another from Cassidy Crawford, and two Wauseon errors. The Indians got three points back on two blasts from Lexi Sauber and a Willard serving error, however, three Lydia Wiers kills and an Indian error helped the Flashes keep their distance at 9-3. This seemed to be the theme for the entire match. Whenever the Indians tried to make a run, Willard had the answer. After trailing 3-0 in the second game, the Indians answered with a run of six straight points. Sauber’s two kills started the rally, then Maddie Trejo tacked on an ace, and Sauber scored twice around a Willard error to put them ahead 6-3. Wauseon clung to that marginal lead until a Lydia Wiers shot down the middle and an Indian miscue knotted the score, 8-8. The two squads traded the next two points before the Flashes ripped off six straight. Lydia Wiers broke the tie with a block, Crawford scored from the middle twice, and a total of three Indian errors gave Willard a 15-9 advantage they would not relinquish. 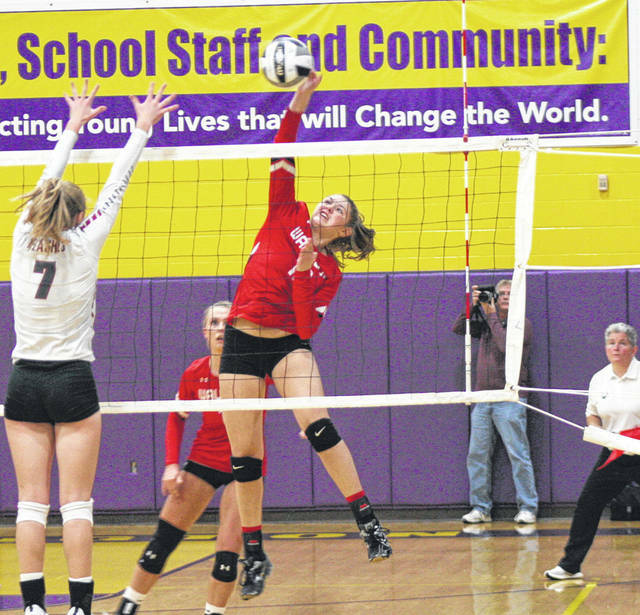 Willard also pulled away from Wauseon in game three. Consecutive Sydney Zirkle kills got the Indians within 10-8, but the Flashes scored nine of the next 11. Chloe Wiers blasted one down the middle and there were two Wauseon mistakes. Sauber and Chloe Wiers then traded blocks, and Lydia Wiers’ shot from the left made it a six-point difference and forced a timeout from the Indians. The Flashes did commit an error out of the stoppage, however, kills by Chloe Wiers and Lydia Wiers plus two aces from Chloe Weaver increased the lead to an insurmountable 19-10. Wauseon finishes the season at 20-6 with a league, sectional and district title to their credit.